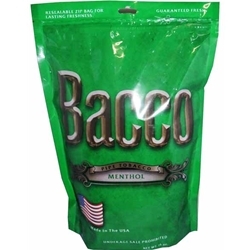 Bacco Menthol Pipe Tobacco, features the world’s finest tobacco, the Kentucky Burley leaf. Stringently selected, and blended together at the right temperature, with minty flavors and ingredients that are hard to match. The ultimate results, a satisfying smoke each and every time! 16 oz. (450g) (1 pound) pouch. 12 oz. (340.19g) (0.75 pound) pouch. 6 oz. (170.1g) (0.375 pound) pouch. Bacco offers a more enticing option for anyone seeking a satisfying alternative to dull, flavorless pipe tobaccos. Once you try Bacco, you will enjoy fresh pipe tobacco, as it is packed carefully into zipper foil pouches to maintain the right moisture level. Say farewell to regular boring pipe tobacco brands, and enjoy the uniqueness of Bacco right here at Smokers Discounts!